In a week that has seen the announcement of the first woman bishop in the Church of England it is interesting to reflect that if a particular person had, at some point in the past, said ‘yes’ instead of ‘no’ the announcement would not have been made. And if you’re wondering who I mean then let me explain. We’re going back to the year 1529. Because had Pope Clement VII said ‘yes’ to Henry VIII instead of ‘no’ then the whole issue of women bishops would never have arisen. Henry had asked the Pope to annul his marriage to Catharine of Aragon so that he could marry Anne Boleyn. The Pope, after consideration, decided that he wouldn’t. Henry, not someone to take ‘no’ for an answer, removed the Pope as head of the Church in England, and replaced him with himself. Presumably it had never crossed the Pope’s mind that Henry would do such a thing. But what if the Pope had said ‘yes’, had granted Henry’s annulment? Well, the Church of England would not exist. The Roman Catholic Church would have continued to hold sway. With the English Church still part of Rome the rest of the Protestant Reformation may well have ultimately collapsed or at least remained insignificant. There would have been no war between England and Spain during the time of Elizabeth, no Spanish Armada. The whole course of European history would have changed, and consequently the history of Europe’s colonisation of Africa, Asia and America. And given the Roman Catholic Church’s well-recorded historical opposition to scientific development – scientists such as Copernicus and Galileo were famously condemned for arguing that the earth revolved around the sun – it is likely that we would live in a very different world today, dominated by religion rather than science. The possibilities that asking ‘what if?’ give us are so intriguing that there is a whole genre of fiction dealing with alternate histories – history as it might have been if something had happened differently. My own person favourite of these is by Kingsley Amis and is about the Reformation. In his novel The Alteration he depicts a world where the Protestant Reformation never took place, Martin Luther became reconciled to the Roman Catholic Church, and eventually became Pope. Because of this, in Amis’s alternative history the Papacy still holds sway in twentieth century Europe. The book tells the story of Hubert Anvil, a chorister in twentieth century England, whose voice is so wonderful that it comes to the attention of even the Pope. And because it is so wonderful the decision is made that it must be preserved at all costs – and Hubert goes on the run because he doesn’t want to be a castrati! And if you don’t know what one of those is, ask our choir mistress after the service, who will explain why we don’t have any in our choir! What if? Many of those historical ‘what if?’ questions are about the decisions people made. Often major events of world history have developed in a particular way because one person at one point in time made a historic decision to do this rather than that! And one of the greatest ‘what ifs?’ must surely be that presented to us in our gospel reading this morning. What if Mary, instead of saying ‘yes’ had said ‘no?’ What if, instead of having heard the angel’s message, Mary had not said ‘Here am I, the servant of the Lord: let it be with me according to your word’ but had said instead ‘You must be joking, I wasn’t born yesterday you know! Go and find someone else!’ Would there have been no Saviour? Would God have never been born into our world? Had God previously asked other young women who had said no? I’m too young to start a family! I’m not yet married and I might get stoned to death for having a baby outside of marriage! Joseph won’t want me and I don’t want to be a single mother! No-one is ever going to believe me when I tell them the baby is the result of an angel appearing in my room! What we do know for certain is that she said ‘yes’ and the rest, as they say, is history. As a result of her willingness to do what she was asked God came into our world. And what I’d like us to think about this morning is how Mary is a model for the way that each of us responds to what God asks of us. So often we fail to make that positive affirmation that Mary made, and never get any farther than ‘what ifs’ – what if I do this, what if I don’t do that, will God really be bothered that much? So let us look at Our Lady and see what she teaches us. Now, I call her Our Lady at this point because I’m going to suggest four things for you to remember that begin with letters spelling LADY. L is for listen. Listening is pretty important when it comes to knowing what God might want of us. And listening involves prayer. Mary wouldn’t have known what God wanted of her had she not listened to his message, conveyed to her by the angel. If you don’t listen to God in prayer, how will you know what he is saying to you. Just as he had a will for Mary’s life so he has a will for yours. L is for listen. A is for ask. It’s okay to ask God questions. 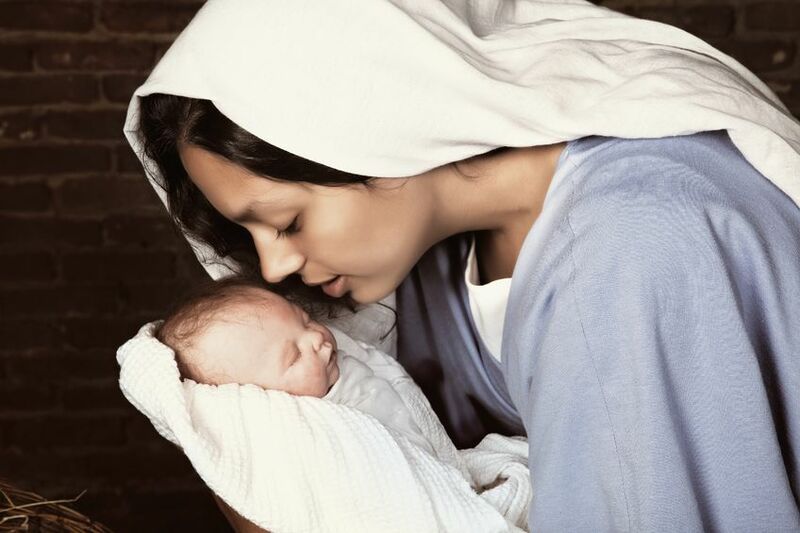 Mary said, ‘How can this be…?’ If you’re not sure what God is doing or saying then ask him. God is only too happy for you to ask him to make himself clearer to you. Life is full of uncertainties, and sometimes those uncertainties may be about what God wants us to do. A is for ask. D is for decide. Having heard God’s message, having asked for some clarification, Mary makes her decision. There’s no ‘Well, I’m not sure – go away and come back next week so I can have time to think about it!’ Mary’s relationship with God is such that she is able to trust him and make her decision. When it’s clear what God wants of you don’t obfuscate or prevaricate. Don’t put off to another day the decision to follow God’s will for you. D is for decide. And Y is for yes. Having made her decision Mary’s yes to God is filled with joy. There’s no ‘Thank you very much for asking, I’m really honoured – but I think Martha who lives next door might do a better job!’ It’s not a grudging yes but a joy-filled, excited yes. She goes straight off to visit her cousin Elizabeth to give her the good news, and Luke records for us that wonderful hymn, full of Mary’s praise for God: ‘My soul glorifies the Lord …’ which we know, of course, as the Magnificat. May our ‘yes’ to whatever God asks of us be filled with as much joy as Mary’s was. Y is for yes. Yes – and when you say yes may your yes be as filled with joy as Mary’s was. Lord, here we are, your servants. As each of us seeks to know your will for our lives, help us to know what that might be. And, knowing, let it be with us according to your word. Amen.